Authentic Florida Key Lime Pie is the first thing you must try when you arrive in the Florida Keys. I promise you won’t be long here before you notice this brilliant but simple dessert on the menu. Actually you have about as much chance of finding Elvis alive as you have going somewhere that doesn’t serve Key Lime Pie. Every restaurant throughout the Keys serves this as a staple diet of the "conchs" who live here, and to be honest you wouldn’t disagree against the reasons behind the plentiful production of this wonderful and tasty pie once you taste it for the first time. 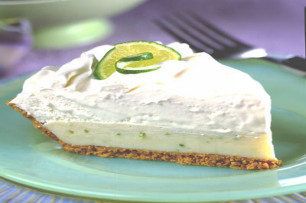 There are many different versions of the Key Lime Pie, and many people claim that they have the secret ingredient that makes their recipe the “Authentic Florida Key Lime pie”. But what is the real version? What adds the authenticity to a pie that to my taste buds always tastes good no matter where I eat it? Well there are many factors to making the ideal pie. Lovers of Key Lime Pie can never agree what is the best way to make one for start. Some say a Pastry Crust is the main ingredient, whilst others say Graham-crackers do the trick. The disagreements go long into the night. The one thing that they do agree on is that under no circumstances should you ever add green food colouring. The filling of authentic Key Lime Pie is a light yellow, and that is because authentic Florida Key Lime Pie uses tiny yellow key limes. These are absolutely bursting with juice. And why do we use the small limes you might be asking? Well quite simply these have more acid and a really strong flavour, and that is what you want as you create the perfect after dinner dessert. Nobody really knows who was the first person to make Key Lime Pie. Most people who research these kind of things believe it is a William Curry (a ship salvager and Florida’s first self-made millionaire) who might have been responsible. 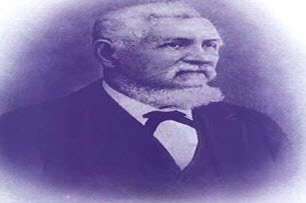 William Curry, or as he was often known Rich Bill, had a servant in his employment called Aunt Sally, and it was this lady who is thought to have created the Key Lime Pie in the late 1800’s. Whether she did create this or just put her own spin on something that was already around at the time we don’t really know. Lost in the midst of time. But we do know that it wasn’t until the 1930’s that the first recipes were written down, and then still there aren’t many documented instructions, as this was a traditional type of food which people passed down from generation to generation. Families just knew how to make it. As the Florida Keys had no milk available to them, and even if they did, had noway to keep it cold, as ice and refrigeration was a distant wish they had to use condensed milk. It wasn't until until the arrival of tank trucks with the opening of the Overseas Highway in 1930, that they had the option of the fresh cold stuff. The brilliantly delicious Key lime pie, might have taken its name from the small fruit plentiful in the Keys, but really it was the condensed milk that gave it its crowning glory. It would not be the same without this, we are sure of it. So now you know the history I guess you want to start making one. So ladies and gentlemen, I introduce to you the one and only. Authentic Florida Key Lime Pie recipe. Remember like everything you can choose specifically what type of ingredients you want to use. Be creative if you get the urge. Its ok to say that you want the most authentic Florida Key Lime pie sitting on your plate, but if you haven't got the exact stuff then experiment. Get your cracker crumbs, and mix it altogether with some sugar and melted butter. Press onto the bottom and up the sides of the prepared pan. Bake for about 10 minutes or until set and lightly browned. In the bowl of your electric mixer, with the whisk attachment, beat the egg yolks until pale and fluffy (2-3 minutes). Gradually add the condensed milk and beat until light and fluffy (3-5 minutes). Scrape down the sides of the bowl and then beat in the lime juice and zest. Pour the filling over the crust and bake for about 10 - 15 minutes, or until the filling is set. Once it has completely cooled, cover and refrigerate for several hours or overnight. Once the filling has chilled, in the bowl of your electric mixer, with the whisk attachment (or with a hand mixer), beat the whipping cream and sugar until stiff peaks form. Either pipe (I used a Wilton 1M star tip) or place mounds of whipping cream on top of the filling. Can be stored in the refrigerator for a few days.